McDaniel offers a few reusable water bottle filling stations, like this one located outside of Glar. (Jake Scott). According to a 2017 report from The Guardian, 1 million plastic water bottles are purchased world-wide every minute. That’s expected to jump another 20 percent in the next two years. 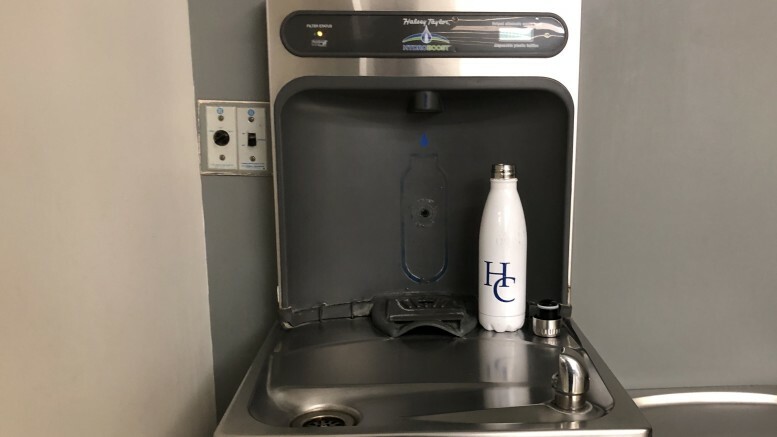 And plastic water bottle use in the U.S. is particularly problematic, according to Chase Hartman, marketing coordinator for Atlantic Blue, a water treatment company. “On average, Americans throw out approximately 78,000 water bottles every minute and 2.5 million water bottles every hour,” said Hartman. These stats show how much plastic is thrown out by humans and the majority of that plastic either goes into our oceans, pollutes our land, and also hurts animals. What those statistics don’t tell you is that every time you drink out of a plastic water bottle, you are drinking tiny pieces of plastic that can get stuck in your bloodstream. In a 2018 article from Business Insider, Aquafina, Nestle, and Dasani are called out for the plastic particles within their bottled water products, which the author mentions negatively affect the human body. This is particularly alarming because it has yet to be uncovered what exactly these plastic particles are doing to humans. Not knowing what these small plastic particles are doing to our bodies is scary because every time we are drinking from a water bottle, we could be harming our bodies rather than helping them with drinking water. Given that plastic water bottles are not only thrown out at egregious rates, but that they also may harm your body while doing so, I ask for all of you to stop using single-use plastic water bottles. It is ruining the environment every time you throw one away and it is also harming yourself every time you drink out of one.